Fickle Feline: The Vaccination Debate. 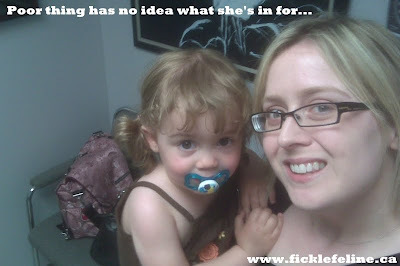 Cameron got her 1 year MMR shot yesterday. She turned 2 last month. I don't consider myself on the anti-vaccine bandwagon, and I have read the findings of numerous studies which have concluded that vaccines (specifically the MMR) do not cause Autism. I just wasn't comfortable, in my heart of hearts, in having Cameron get the MMR at one year of age. I don't believe that Max getting the MMR vaccine gave him Autism, but I don't think it helped him. I have a feeling that in years to come, with a lot more research, what will be found is that if a child is showing symptoms of being on the spectrum, then vaccines, specifically the MMR will not be administered as they may contribute to making symptoms of Autism and other spectrum disorders more severe. Keep in mind this is just my opinion. Both my children are vaccinated. I did delay Cameron getting vaccinated, but she is now on a schedule to get caught up. I'm not a huge fan of Jenny McCarthy and I think that her anti-vaccine campaign has done more harm than good. The Autism community seems to be split down the middle on the vaccination debate. I'm not about to tell a parent that getting vaccinated didn't cause their child to lose his or her ability to speak, to regress into the world of Autism. Parents know their kids better than anyone else, and if their observation was that their child got vaccinated and then BAM!, everything started to fall apart, then there is probably something to that. I have written about the fact that I saw a lot of markers for Autism in Max's first year of life. I think the reason a lot of people point fingers at the MMR vaccine is that it is administered when a child turns one. In the first year, all of the developmental milestones we look for are around mobility. Is the child rolling over, sitting up, crawling, walking? In the second year of life, the focus shifts to communication - is the child speaking - one word, two word combos, labelling, and playing creatively? Those are the milestones that Max wasn't hitting, but there were a lot of other milestones he missed in the first year that we didn't know to look for, or we just wrote off when our doctor told us we were being nervous first time parents and that we shouldn't worry. The key to all of this is that a lot more research needs to be done on the causes of Autism, how to diagnose early and of course what the most effective treatments are. Nobody should have to live with Autism - not the individuals suffering with it, or their families and friends left helpless and devastated by it. 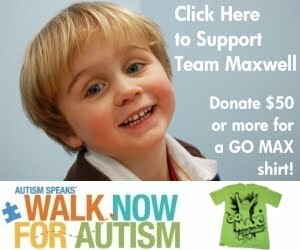 Please support us by sponsoring us and/or joining us for the Autism Speaks Walk For Autism on June 20th. It would mean the world to Max, Scott, Cameron and me. I am in total agreement Kat...well put. Mental Health Monday: I Try. Photo Essay: Walk Now For Autism 2010. I'm Good, What They Tell Ya. Photo Essay: Cam's 1st Restaurant Experience. More Family Than You Can Shake a Stick At. The Good, The Bad, and The Family. Before and After: Dining Room Makeover.